Spanning well over three decades of expertise in banqueting and related services the Galadari Hotel has always been a top of the list venue for weddings, meetings and conferences. The hotel is synonymous for its applauding service and attention to detail alongside its ability to provide exceptional food and beverage. 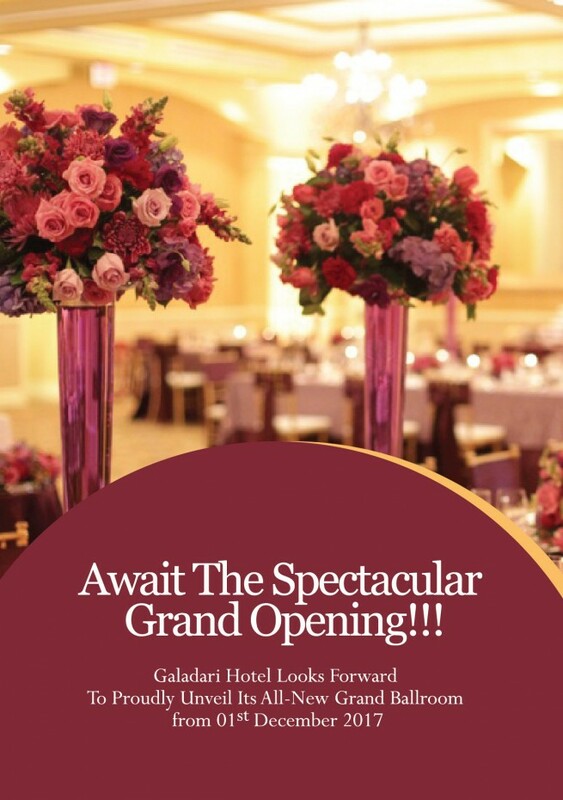 As the hotel proudly celebrated its 33rd Anniversary recently laying claim to a great stake in the hospitality industry the Galadari unveiled a breathtaking all-new Grand Ballroom in late November this year and it will benchmark a new era in banqueting. The new and modern Grand Ballroom is an exceptional blend of elegance and style. No surprise that it will be a crowning glory to the Galadari Hotel adhering to all futuristic expectations with regards to delivering exceptional services with a Sri Lankan touch.